The game show Treasure Hunt had three series on TV: 1956 – 1959, 1973 – 1977, and 1981 – 1982. Generally, two contestants (three in the 1973 – 1977 series) play a mini-game where the winner earned the right to hunt for treasure. On the treasure hunt, the contestant selected from 1 of 30 (66 in 1981 – 1982) boxes. Each box had a cash envelope that was offered as a sure thing. Either the contestant took the sure thing or took the box. The boxes contained various prizes, from cars and trips to “klunks” (prank prizes not worth very much). One box always had a cash jackpot. In the 1973 – 1977 series, the jackpot box had $25,000. In the 1973 -1977 and 1981 – 1982 series, the contestants were always female. 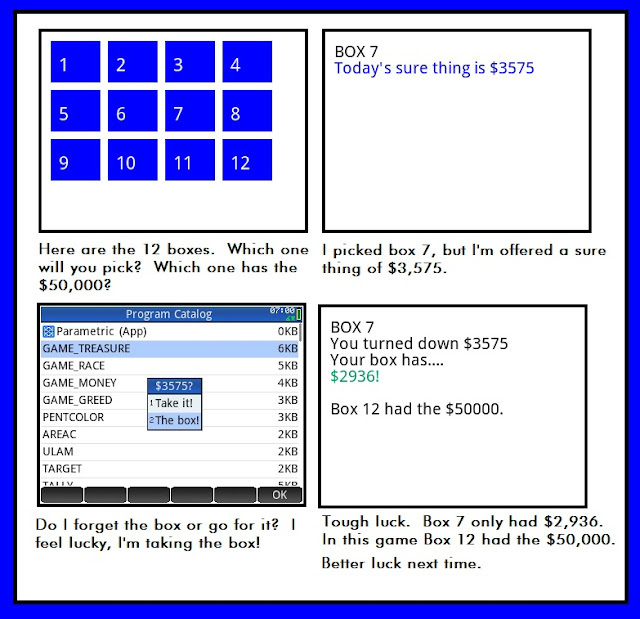 The program GAME_TREASURE presents you with 12 boxes, one has $50,000. Select a box by just tapping the screen. You will then be presented with a sure thing. A choose box will be presented where you make your choice to take the sure thing or take a risk and open the box. Good luck. Below is an example game in progress.